Last week I predicted that Legends of Tomorrow would rebound after a less than stellar episode (“Progeny”), and I was proven correct. “The Magnificent Eight,” may just have been the first season’s finest hour to date. The fun began when the Legends travel to the old west and the town of Salvation, in the Dakota Territory, in 1871. This is one of the temporal blind spots where time is fragmented and Rip hopes the Hunters will not be able to track them there. Rip suggests that everyone stay on the ship, but the other members of the Wave Rider crew decide to investigate the town out and promptly raise the ire of the local outlaw who is terrorizing Salvation, Jeb Stillwater (Brent Stait) after Snart kills one of his men who was getting ready to draw on Martin who had just bested the owl hoot in a game of poker. 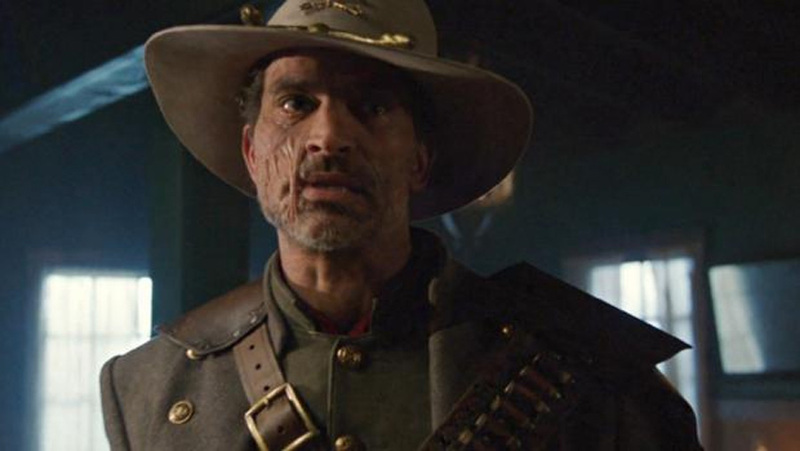 The Legends are helped out by the one hombre who happens to be badder than any of the Stillwater Gang, Jonah Hex (Johnathon Schaech). Hex realizes immediately that the Legends don’t belong in this time period, and that they are time travelers. He also knows they must be with Rip. As it turns out, Rip and Hex are old friends. Indeed, the duster that Rip wears used to belong to Hex and Rip even named his son after the gunslinger. The two of them had even gone up against Quentin Turnbull, Hex’s greatest nemesis in the comics, the last time they were together, which was just before Rip had to leave the old west and Turnbull destroyed another town, Calvert, OK in 1868. Rip tells the others that he understands the appeal of this time period and the many opportunities it presents for heroism all too well, which was why he had to leave it. In the end, Rip steps up to help his team save the town and put Stillwater and his gang down once and for all. Also during this episode, Stein meets a young mother, Sarah (Anna Galvin), whose son, Bertie (Glen Gordon) is dying of Tuberculosis, and he goes against Rip’s wishes and saves the boy with advanced medicine. In the end, we learn the boy will grow up to become H.G. Wells. Meanwhile, Kendra meets an older version of herself (Anna Deavere Smith) who is living out one of Kendra’s forgotten, past lives after having lost Carter. Older Kendra warns her younger self that she has tried to be with other men after losing Carter before, but those efforts to love again never ended well. Even though the men she cared for were good and decent, they were never her soulmate like Carter was and in the end, she only ended up hurting them. 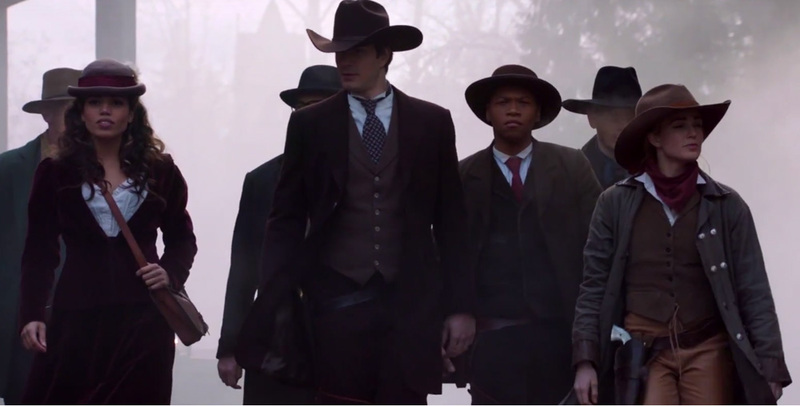 The episode ends with the Legends having to take out the Hunters, who have tracked them down to 1871, and learning that the Time Masters are calling out the biggest gun they have, the Pilgrim, who has been charged with hunting the Legends down, one by one, and killing the younger versions of the team. Yeah, it sounds a little too Terminator for me too, but, hey! It could be fun. So! What was it about this episode that made it so good? First off, the old west setting is a blast (course I am a sucker for a good western anyways) and the appearance by Schaech as Jonah Hex really gives this episode a shot in the arm. This is what the show should be about, using time travel to meet some of the more colorful and outstanding characters that make up the history of DC Comics. Also, it is appropriate to feature Hex on this show, given the character’s experience with time travel. I only regret that Schaech wasn’t used more in the episode, but I am already hearing some online clamoring that he should be a part of next season’s cast. 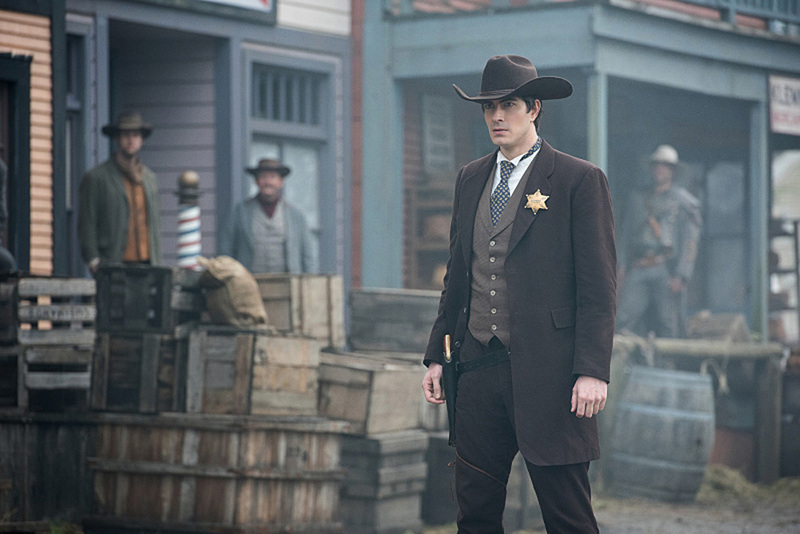 The episode is also worth checking out because it gives us some more insight into Rip Hunter and we learn why his fashion sense screams the old west so much. We also learn more about the man. At heart, Rip longs to be a hero and he wants to do the right thing, but his sense of duty to the Time Masters kept him from down that when Calvert was on the line. Thankfully, when someone needs to go up against Stillwater in a shoot-out, Rip does do what he was born to do: save the day. The subplot with Kendra meeting herself in a past life is something else a show about time travel, that features a character that can reincarnate, should have been using to fuller effect before now. The storyline with her and Ray as a couple has been handled nicely so far, and has evolved logically to date. But always in the back of my mind is the question of who does Kendra really belong with? There can only be one man: Carter. Hearing older Kendra tell her younger self this hard truth is tough and I get the feeling more and more that Mr. Palmer is going to end up brokenhearted. 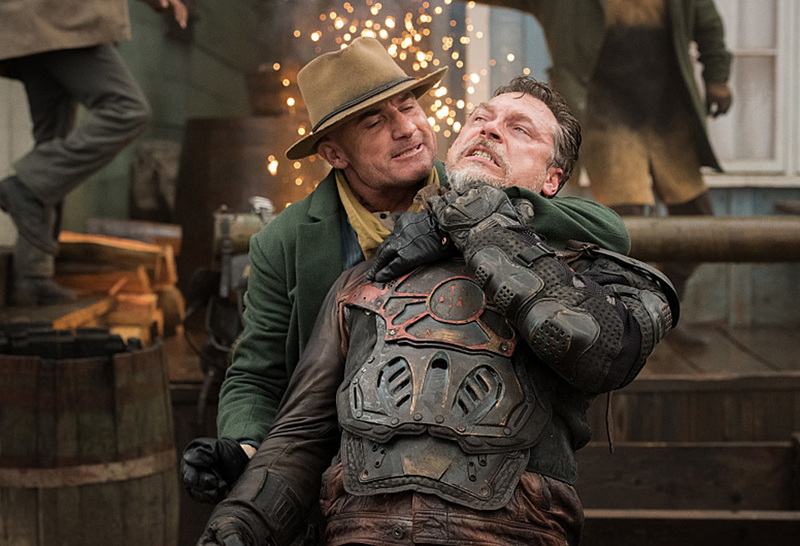 That is a real shame, because it is scenes like Ray stepping up to be the sheriff of Salvation, and the character’s enthusiasm and excitement about being in the old west that make me wish he could get the happy ending he deserves. Ray’s a good man, just as decent and honest as Grant Gustin’s Barry Allen, and it is developments like this that make me believe this love story will not end well for him. Speaking of things not ending Wells, excuse me, well, the subplot with Stein and the dying child is noble in thought and deed, but having the child turn out to be H.G. Wells…oh, that could have been executed so much better. First of all, there is the historical inaccuracy of the situation, but then there is the whole reveal that is just a bit clichéd. Personally, I think it would have been better to have left Bertie some anonymous individual, someone who Stein was able to save, and leave it at that. Or, if they had to have him turn out to be someone famous, make him someone who was vital to the DC Universe. Having him be H.G. Wells though, that just left me cold. Still, in spite of that one fumble, “The Magnificent Eight” is still a winner and I give it 4.5 Stars.